Note: Countries without commercial nuclear reactors are not included. Belgium, Bulgaria, the Czech Republic, France, Hungary, Slovakia, Slovenia, Sweden, and Switzerland use nuclear energy for over 30% of their electricity generation. 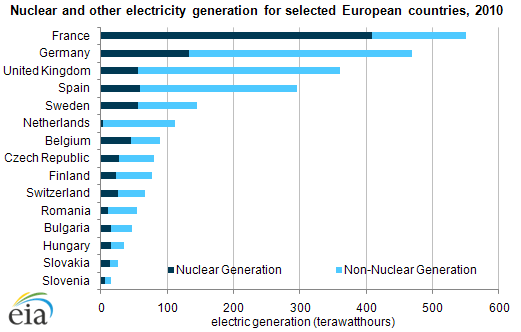 Nine European countries generated over 30% of their electric power from nuclear sources in 2010. An additional five countries generated over 20% of their power from nuclear sources. Germany, which ranked second in both total and nuclear generation in 2010, has announced plans to phase out nuclear generation by 2022. Recent issues in European energy policy include a reassessment of nuclear power following the accident at Japan's Fukushima nuclear facility in March 2011. While Germany, Switzerland, Italy, and Austria have resolved to reduce or eliminate their reliance on nuclear power in the aftermath of that event, France plans to continue its current extensive nuclear program, as does the United Kingdom. Germany currently generates about a quarter of its electricity from nuclear power, yet announced plans to decommission its more than 20 gigawatts of nuclear capacity by 2022. Switzerland generates over a third of its electricity from nuclear sources, but has decided to halt development of new facilities. Existing plants will be permitted to operate until the end of their lifetime, effectively phasing out nuclear power in that country by 2034. Italy and Austria do not have commercial nuclear reactors; however, in a recent referendum, Italy voted against new nuclear construction, and Austria has decided to end their imports of electricity generated from nuclear sources by 2015. Countries within the European Union (EU) must consider EU-wide energy goals, which include a 20% decrease in greenhouse gas emissions by 2020 (from 1990 levels). Because nuclear power does not emit greenhouse gases, the loss of the nuclear component in the generation portfolio in some countries will make it harder for them to meet the national commitments that have been made in support of this EU-wide goal.